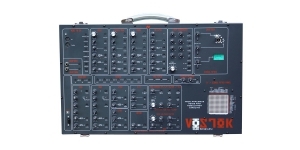 Vostok is a portable modular synth with an amusing pin-type matrix panel for patching. The unit borrows some concepts from EMS Synthi A released in the 1970s. The unit’s circuitry is analog except the MIDI part and wavetable oscillator. The instrument comprises 2 VCOs, digital wavetable synthesis, noise, two filters, a VCA, two ADSR envelopes, two LFOs, a mixer, ring modulation, and an 8-step analog sequencer. Vostok can interact with MIDI gear via an onboard MIDI-to-CV converter. The instrument is enclosed into a rugged steel housing with chrome catches and steel spring handle. 22x22 matrix pin panel, joystick, retro-VU meter, jack-type patch points, 13 LEDs are provided for control. The 8-step CV/Gate sequencer is integrated. VCA has a 1/4" jack audio output. Modular System, Analogue (A), Monophonic, Oscillators overall: 3, Oscillators per voice: 1, Sub-Oscillators per voice: 1, Production ended: Yes.